Safe Cabinet, Workshop of Charles Rohlfs, Buffalo, NY, 1901, Oak, Glass, Copper. 82 x 24 x 24 in. 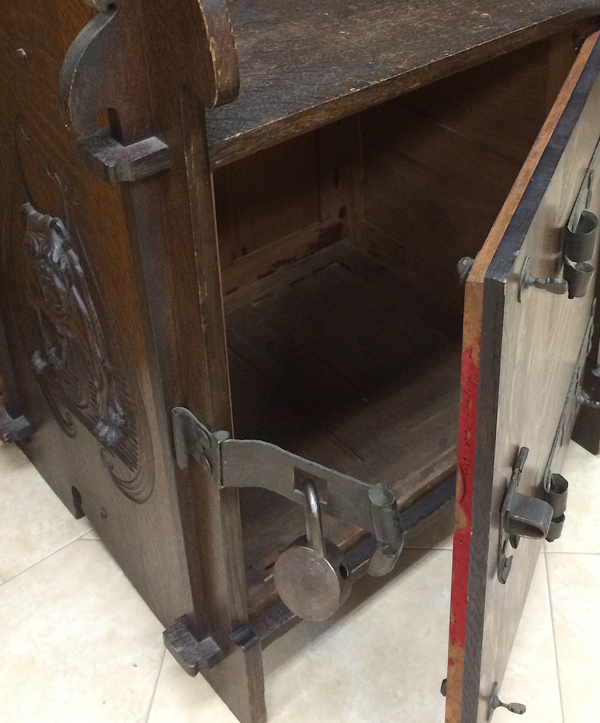 "This safe cabinet by Charles Rohlfs is almost certainly unique; it is said to have been made for the businessman Rudolph Oelsner, a successful beer importer with premises on West Broadway in Manhattan and a 300-acre estate in Roslyn, Long Island. It has a deep, lobed and curvaceous gallery top flanked with paired tenon-and-key joints, an ovate glass panel door with a shaped, relief-carved, cruciform overlay and three adjustable shelves inside the upper cabinet for displaying decorative objects. 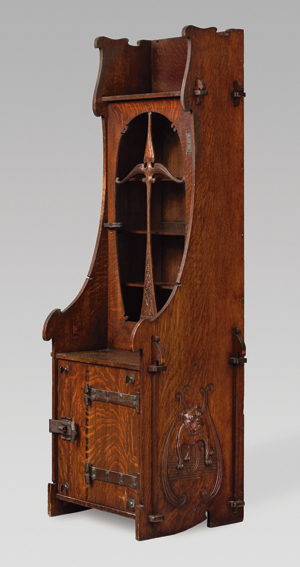 The box-like bottom section of this tall cabinet once housed a safe, and the solid oak planks, split and scrolled iron strapwork, and elongated, sword-like tenon-and-key joints at the sides integrate structure and ornament while stressing the theme of security. The naturalistically carved bulldogs that flank the safe compartment seem, at first glance, to be discordant add-ons unrelated to the cabinets Art Noveau profile and decorative detailing, though they were evidently of personal significance to the client. Yet their presence makes symbolic sense: they are fierce guard dogs, warding off intruders and "protecting" the contents of the safe". Though Charles Rohlfs was making furniture for his own home as early as 1888, it was not until about 1897 that he began to produce furniture commercially. Initially, he designed and made the furniture himself, though his wife Anna Katherine Green sometimes collaborated with him as designer and, briefly, maker. Although his shop remained a small operation with never more than a handful of workers, his production processes were efficiently organized, and Rohlfs, like the other furniture makers made full use of power-driven machines. Some Rohlfs furniture is rectilinear and emphatically structural, though most of it is enriched with carving, sawing out, shaping, molding and fretting. His furniture was briefly offered by Marshall Field's Chicago department store in 1900, but otherwise Rohlfs promoted his work by giving occasional lectures, seeking magazine coverage, and taking part in exhibitions. He showed his furniture at an Arts and Crafts exhibition in Buffalo in spring of 1900, and at the end of that year he participated in a National Arts Club exhibition in New York City. The next year, he participated both as an exhibitor and as an organizer of the Pan-American Exposition in his hometown of Buffalo — where he was said to have designed booths for several commercial exhibitors and in Turin, Italy, at the International Exhibition of Modern Decorative Arts in 1902. After he retired from furniture making around 1907, Rohlfs became a leader of the Chamber of Commerce in Buffalo. He actively campaigned for child labor reform and was an advocate of the metric system. Edward Henry Potthast, an American Impressionist. Beach at Far Rockaway, oil on canvas, 24 x 30 in., signed E. Potthast, l.c. Edward Henry Potthast (1857-1927) was born in Cincinnati, the son of a German cabinetmaker. Along with contemporaries Frank Duveneck and John Henry Twachtman, Potthast eventually became one of the most significant artists to emerge from the burgeoning art milieu of Cincinnati during the nineteenth century. He is best known for his playful and brightly colored beach scenes depicting men and children enjoying sunny days and the sparkling surf. Vibrant images of balloons, hats, and umbrellas add to the sense of cheerful and carefree days. The Two Red Roses Foundation considers Edward Potthast one of the most significant figures in American Impressionism and owns four Pottast works in its painting collection. 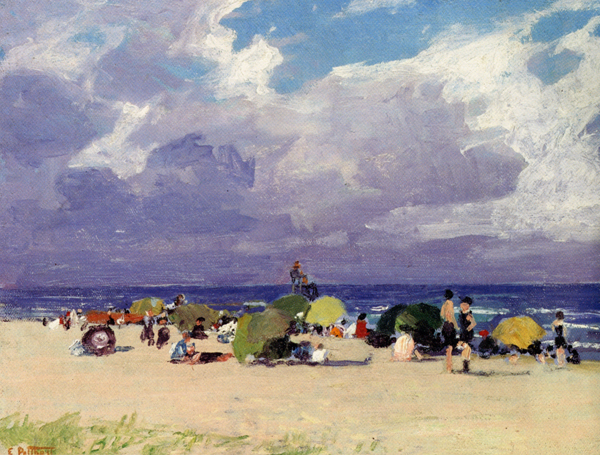 Beach at Far Rockaway, pictured above, is a classic example of Potthast's impressionist style and vibrant palette and demonstrates his consummate skill in capturing the carefree leisure of a bright summer's day at the beach. Potthast employs a low horizon line to accentuate the vastness of the intense cobalt blue sky. The flat, sandy shore is punctuated by colorfully-clad children and mothers and numerous white beach umbrellas. 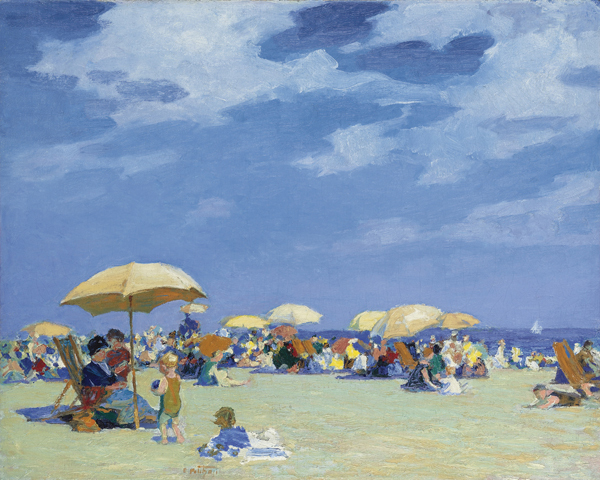 Paintings such as Beach at Far Rockaway won Potthast critical acclaim and generated tremendous popular appeal during his career, and today comprise the body of work for which he is best known and most highly regarded. Purchased at Sotheby's American Paintings Sale in 2007, it achieved and holds to date the record price ever paid for a Potthast work at auction. 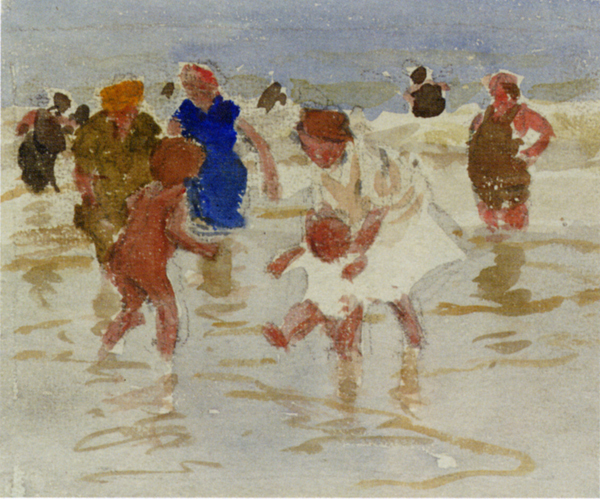 Girls Playing in Surf, oil on canvas, 8-½ x 10-½ in., signed E Potthast, l.c. Potthast received his early training at Cincinnati's McMicken School of Design. After departing in 1881 for study in Antwerp and at Munich's Royal Academy (a destination for Cincinnati artists, many of whom, like Potthast, were of German descent), he returned to Ohio briefly, working as a commercial lithographer and continuing his studies in fine art. 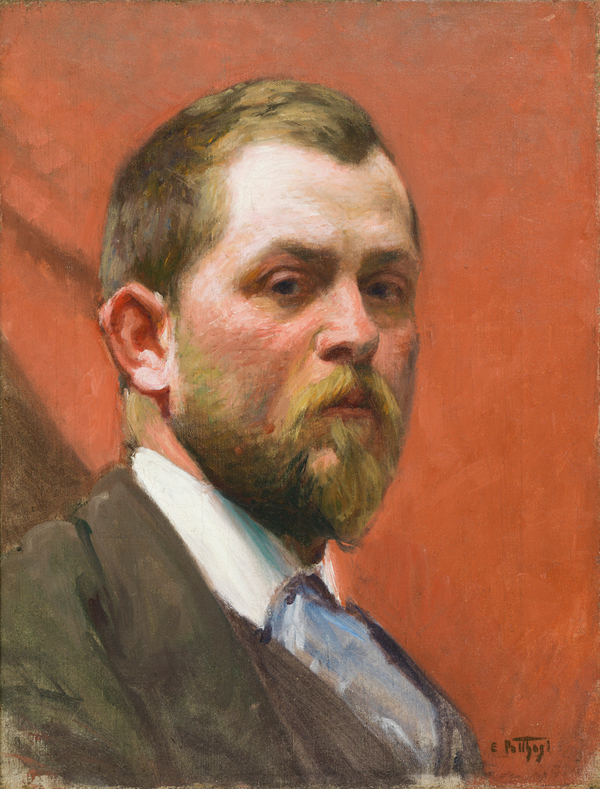 By 1887, Potthast had again set off for Europe, where he enrolled at the Academié Julian in Paris, and exhibited in the Salons of 1889, 1890, and 1891. During this time he encountered the works of the French Impressionists, and influenced by time spent at the art colony of Grez-sur-Loing, south of Paris, began to develop his own impressionistic style. By the time Potthast returned to Cincinnati, his conversion to impressionism was complete: he brought back a number of light-filled canvases, several of which had been displayed in Paris salons. After several years of modest success, Potthast decided to leave Cincinnati in 1895 and move to New York City where he set up a studio. He received numerous commissions from magazine giants such as Scribner's, Century, and Harpers. At the same time, his watercolors and oil painting were exhibited at the Art Institute of Chicago and the National Academy of Design, where he won the Academy's Thomas B. Clark prize for best figure painting in 1899. 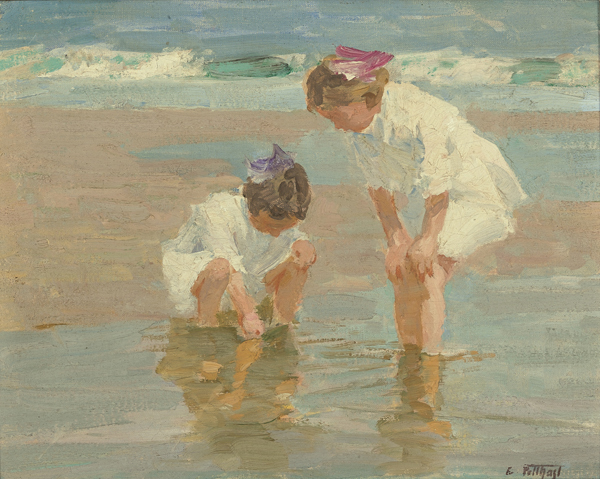 A Day at the Beach, oil on canvasboard, 12 x 16 in., signed E. Potthast, l.l. It was during this time in New York that Potthast began painting the beach scenes and rocky harbor views that were to become his forte. His love of the beach would often find him carrying his easel and paint box to his favorite sites on Coney Island and Far Rockaway, creating images of people enjoying leisurely, fun filled days. He also took frequent trips along the New England coast, stopping frequently at Ogunquit, Maine, and at popular seaside beach towns, including Gloucester and Rockport. The lighter palette and rapid painting technique Potthast adopted in France lent themselves perfectly to the beach and maritime subject matter in which he came to specialize. An extremely private person, Potthast never married and died alone at the easel in his New York studio on March 9, 1927. Representative examples of his work can be found in major public and private collections throughout the United States, including Addison Gallery of American Art, Phillips Academy, Andover, Massachusetts; Albright-Knox Art Gallery, Buffalo, New York; the Brooklyn Museum; The Art Institute of Chicago; Cincinnati Art Museum; M.H. DeYoung Memorial Museum, San Francisco; Museum of Fine Arts, Boston; and the Terra Museum of American Art, Chicago. at the Grove Park Inn in Asheville, North Carolina? The Two Red Roses Foundation is pleased to support this year's annual Grove Park 2015 Arts and Crafts Conference, February 19 through 22. As always, this year's conference brings together the largest assembly of Arts and Crafts dealers, collectors, contemporary craftsmen, and interior designers in the country. If you attend be sure to visit the TRRF booth where noted author David Cathers will be signing his book, "So Various are the Forms it Assumes": American Arts and Crafts Furniture from the Collection of the Two Red Roses Foundation on Saturday, February 21, 2015 from 2:00 p.m. to 3:00 p.m. 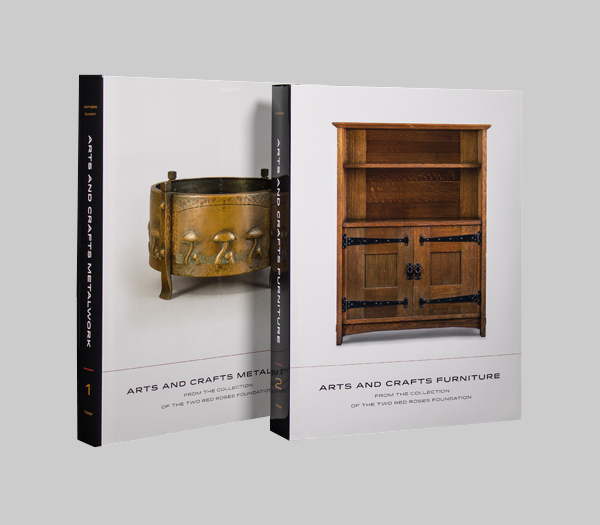 The first two TRRF catalogues of its extensive fine and decorative arts collection are available for sale in our online bookstore along with other publications and exhibit catalogues by TRRF. Before the scheduled opening of the Museum of the American Arts and Crafts Movement in summer 2017, we plan to publish further titles in a series of catalogues of the TRRF Collection, including Tiles and Architectural Faience, Pottery, Lighting, Woodblocks, and Photography. You may also browse through the selection of used Arts and Crafts books by clicking here. We do not process credit card payments. You may utilize Paypal, who will process your credit card payment even if you do not have a Paypal account, or simply mail a check to our address and, upon its receipt, we will ship your purchase promptly.